LEAH'S LIFE: So You Think You Can Dance Tour FREAK OUT! So You Think You Can Dance Tour FREAK OUT! We fell in love with almost every dancer on the show. Actually let me re-phrase, I fell in love with almost every dancer on the show and Scott was in love with Melanie Moore (who ended up winning). Although I had never voted for anyone on any TV show ever, I busted out my computer and voted every Wednesday night as many times as I could for my favorite dancers. We hated the Thursday night show because of the elimination round. We then found out that the top 10 dancers were coming to Utah for part of their tour we bought tickets the day and hour that the box office was open for purchasing and could not wait! The day finally came and we decided to make honorary shirts for the occasion. We had amazing seats! As it started, I couldn't keep my eyes off the stage! I couldn't believe we were there! How many times we have watched the show and then gone back on You Tube to watch our favorite dances again. . .but here they were in person right in front of us! Needless to say we were screaming a lot! During intermission I was just soaking it all in and couldn't believe how amazing all of the dancers were. For any of you that have seen the show on TV and thought the dancers were amazing, I'm telling you it is a million times better live! As I'm in my soaking it all in contemplation mode, this girl that is sitting next to us says, "Can I take a picture of your shirt?" I just laugh, stand up and say "Yeah." She asks me if I think that it is weird that I want a picture of it and I say, "No, I'm flattered!" She then asks me if I want to be in the picture or if I just want my shirt. I told her that she can just take a picture of my shirt. She snaps the picture and I sit down. I lean over to Scott and say "Yeah, I don't care that she is totally making fun of my shirt!" He then says, "No wait, I don't think you understand, she said she is sending the picture to him!" I was so confused and didn't understand what he was telling me. As I further question Scott about what he was talking about I ask him if I should ask her if she is really sending it to him. Scott knows how much I can freak out about things and therefore told me no. Although I respect Scott and his opinion, I immediately yell over him and say "Wait, did you say that you are going to send the picture to him, as in Tadd?" She says, "Yeah, I grew up with him!" I immediately stand up and say, "Um. . . can you take another picture of me in it then and send to him?" She laughs and snaps another picture. That's right. . . this is what he saw, on his phone! I couldn't believe that actually happened. It was so funny to me! Then all of a sudden, just when I thought things couldn't get any better, three people walk down to where we were sitting and started talking to the people next to us. I swear one of them was Tadd's younger brother. As I'm looking at them out of the corner of my eye not trying to be creepy one of them flashes us some stickers, and says "Here you can have these so that you can meet him after the show!" I was so confused as to what was actually happening in my little world. All I can remember is saying "Are you serious?!?!" Then realizing what had actually happened asking them if I could give them a hug. They all just stood there wondering if I was serious (and slightly creeped out). I decided to remain in my chair so they wouldn't take the passes back from us. All of them get up and leave for a minute telling us that they will be back and then the real huge freak out happened for both of us! I could not believe that this was true! Scott getting the chance to meet Melanie!?!?!? Don't worry we have even had conversations over the summer about if he had the chance to meet her what would we he say, and even roll played! During the rest of the show I could not believe that we were going to have the opportunity to meet them. I was trying not to scream as much during the dance routines so I could save my voice in order to muster out an audible sentence of "can I take a picture with you" that didn't last long and the screaming commenced. For any of you that did not watch the show, watch the following videos and then you might understand. Just maybe. . . So as you can see why I love this show! And there are a million other dances that I loved, but you get the idea! After all the amazing dances were performed we got the chance to meet them! Scott and I were one of the first people in line and as we walked in they were all just scattered around the room waiting to meet their fans. We immediately went over and talked to Melanie. As I busted out my camera to take a picture of them, my hands started shaking because this was important! HA HA! I'm not a bad photographer if I must say so myself even with my shaky hands! She even signed his shirt! And accepted by saying of course! 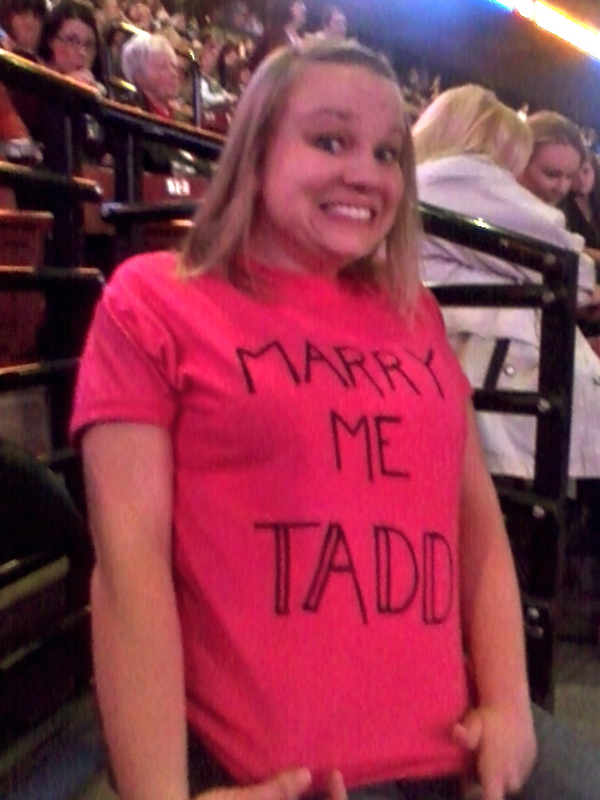 After pushing our way through the crowd I got to meet Tadd! He even signed my shirt too, with a vague answer for my proposal! He drew four different check mark boxes that said Yes, No, Maybe and Hmm. . .Then checked the Hmm. . . box HAHA! It was so much fun! (I decided to spare you with all of the details about what we said to them and how awkward I felt as the crowd was forming and everyone laughing at my shirt as he was signing it because let's be honest, you don't even know who he is. And for those of you who are still reading this after this long of a post, I'm surprised you are still reading! I also tried about ten times to upload the picture we took of me and him but for some reason it's not letting me. SO you are just going to have to trust me that I got one! After all was said and done Scott and I were still freaking out on the drive home and laughing because we do realize that no one even really cares about this but the two of us, and we don't care! Oh my gosh, leah. This is great. Thank you for sharing the best night ever with me!!! Thanks, Leah, for writing! I have to find out about Scott's life through his friends cuz he never calls home. Glad you two had fun! Hey Scott's Dad! HAHAHA! I'm so glad that you found the link to my blog and could read all about the AMAZING-NESS that went on! Scott is sure a lot of fun!